This month down Brit Grit Alley, I take a look at the works of Richard Godwin. Richard Godwin’s Confessions Of A Hit Man is the violent and action-packed story of an ex-marine who becomes a globe-trotting contract killer. A marvelously, hard-hitting slice of international crime fiction. Meaningful Conversations Dark, rich language that paints a deliciously delirious Ballardian Giallo. In Noir City, Richard Godwin unflinchingly and masterfully digs beneath the surface of London, Paris, Rome, Madrid and Dusseldorf, and the cities’ recalcitrant denizens, as he follows the trail of sociopathic gigolo Paris Tongue deeper and deeper into the darkness. Beautiful prose and a claustrophobic sense of dread make Richard Godwin’s Noir City a lyrical hybrid of noir,erotica,crime fiction and psychological drama worthy of Hitchcock or Argento. Richard Godwin’s One Lost Summer is a sweltering, intense noir. A claustrophobic, psychological study of obsession and loss, with echoes of Simenon, Highsmith and Hitchcock’s Vertigo. 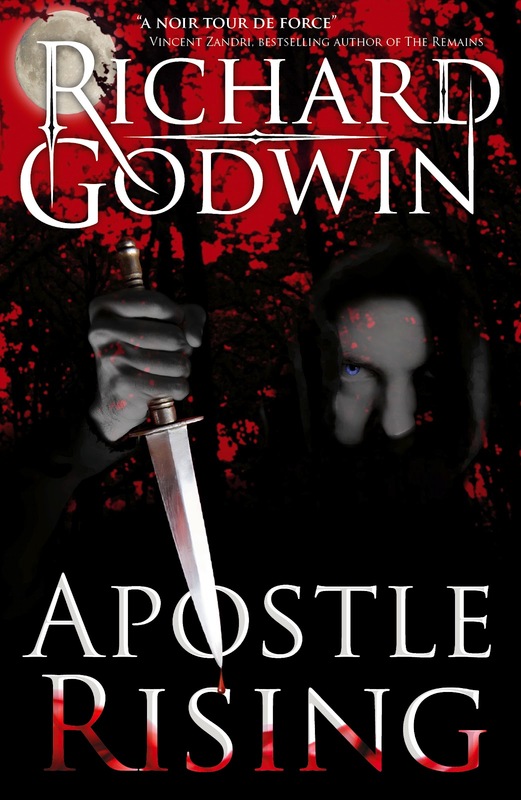 Richard Godwin‘s debut novel, Apostle Rising,is a dark as the void between the stars. As black as a killer’s soul. On the surface, Apostle Rising is a police procedural. A serial killer novel. And a damned good one it is, too. It’s the story of a haunted policeman- and the killer he never caught. Detective Frank Castle is still living in the pitch black shadow of The Woodlands Killer – the one that got away. But then a copycat killer crawls through the cracks in the pavement and Castle and his partner are dragged down a tunnel to gaze into the abyss. But Apostle Rising is more than that. It’s also wonderful, rich prose and a breathtaking plot with more than a few savage twists of noir. London kills you. Kills the best of us. And the worst. And in Richard Godwin‘s second novel, the brilliantly vivid giallo, Mr Glamour, the streets of London aren’t so much paved with gold, as splattered with blood that leaves a trail from the pavement to the penthouse. And back again. Mr Glamour‘s London is the London of Hitchcock’s Frenzy, Roeg’s Performance and The Picture Of Dorian Grey. It is a living, pulsating thing that is being sliced to pieces, from swanky Mayfair and Holland Park to suburban Acton, from Wandsworth prison to Earls Court bedsits and East End boozers. And in Mr Glamour, everyone is scarred, including the books’ protagonists, Chief Inspector Jackson Flare and his partner Inspector Mandy Steele. Though Flares scars are mostly physical, Steel hides her psychological damage. When Flare and Steel are called to investigate the murder of a rich big shot, whose body has been ripped apart and left next to his gleaming Maserati, they soon realize that they are a hunting a serial killer who is preying on the rich, the powerful, the glamorous. Mr Glamour is a graphic,intense, at times delirious journey into the dark sides of London’s glitz and of the human psyche and is highly recommended for those of a STRONG disposition. Godwin's latest novel is Paranoia And The Destiny Programme , a powerful and disturbing, Dystopian horror story.